Located within a convenient driving distance from Cape Canaveral and the Orlando theme parks, New Smyrna Beach offers its own 13 mile stretch of unspoiled white sand. The city's beach is rated as one of the best beaches, and a stay at New Smyrna Beach rentals places you and the family close enough to allow for a memorable stay on Florida's Atlantic coast. 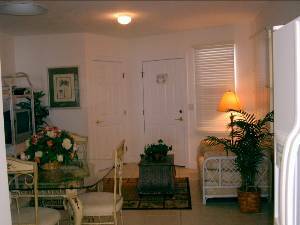 There is much to do in this bustling community, and there is nothing like retreating back to New Smyrna Beach vacation rentals at the end of the day and calling the place home just for a while. If lying out on the sand and swimming in the ocean are your thing, then this is the perfect vacation spot. Nature and civilization blend well here, and an excursion to the Canaveral National Seashore offers a chance to swim in unspoiled waters, go bird watching, or take a hike. Take the family on a weekend fishing trip to Mosquito Lagoon or charter a fishing boat out into the Atlantic. Peaceful cruises along the Indian River allow the family to be one with nature, and also get up close with endangered manatees. New Smyrna Beach vacation rental homes are the place to return to at the end of the day, because you still have the open space to appreciate, rather than the small confines of a motel room. Appreciate the sound of the sea from your base at New Smyrna Beach condo rentals. Take in the salt air and spend the day in. You can throw together lunches for the entire family and enjoy the down time. Accelerate the pace with a trip to New Smyrna Speedway and watch the drag racers compete for the winning slot. During a rainy day, take the kids to the Timeless Wings and Wheels Museum, built into an airport hanger, or New Smyrna Museum of History for some lessons in the area's past. The New Smyrna area also offers visitors the chance to indulge in the arts if they so desire. The town is known for its arts culture and you and the family can browse art galleries in the Atlantic Center for the Arts or the many other galleries spaced throughout the local streets. Fitness enthusiasts can find many spas and gyms to get their fix, and outings on the golf course are possible at the many courses that surround New Smyrna Beach. Everyone in the family can find their own niche, and the expenses saved by staying at New Smyrna Beach vacation rentals affords the budget to spend on local attractions. A family vacation should be spent in total enjoyment, and by planning a stay at New Smyrna Beach rentals, you will ensure that everyone is happy. Nobody will forget the experience of getting up in the morning in a spacious apartment, feeling right at home on the beach, and the memories that last forever. Stay by the beach or take afternoon excursions; New Smyrna Beach vacation rental homes are convenient and affordable so the whole family can experience this lifestyle. Interested in More New Smyrna Beach, Florida ? Check out nearby Daytona Beach , Daytona Beach Shores , Edgewater , Eustis , Flagler Beach , Orlando , Ormond Beach .